We all know LCD prices are dropping, but this is getting ridiculous. 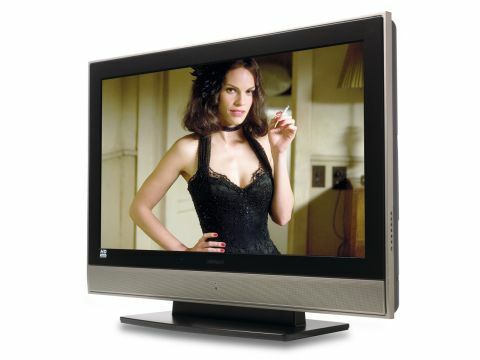 The 37LD8600 - a 37in LCD TV - is yours for a grand, a cost-to-screen size ratio that represents amazing value for money. And the best part is that Hitachi hasn't sacrificed performance to meet this highly tempting price tag. The company gets things right from the off with a surprisingly attractive design that incorporates a black screen frame set against a grey outer chassis. This won't set the Milan catwalks alight, but it's prettier than you've any right to expect at this price. HD-ready status is achieved by the inclusion of HDMI and component video inputs on the rear, plus a screen resolution of 1366 x 768 pixels. Two HDMIs would have been nice, but one will suffice for most people's needs. At least until they pick up a Sony PlayStation 3, a HD DVD or Blu-ray player: these purchases will have to be accompanied by an HDMI switcher, to avoid repeatedly changing cables. These are backed up by two Scarts, a PC input - a handy inclusion if Al Gore pops round with one of his PowerPoint presentations - plus a subwoofer output in case the neighbours have trouble hearing the bass from the 37LD8600's built-in speakers. As for features, there's very little to write home about. In fact, it's not even worth a quick email. While there is a film mode to smooth fast motion, noise reduction settings, and a pseudo-surround audio setting, there's no digital tuner, (an oversight, but one that can be easily corrected by buying a Freeview adapter or PVR) and no fancy picture processing such as the Picture Master HD technology found further up the range ladder. But none of this is particularly surprising at this price, and in any case you'll forget all about it when you clap eyes on the fantastic picture quality. With standard-def material from a Sky HD box, the set achieves a level of sharpness that many budget rivals can only dream of. Having a strong signal from the source helps, which is why channels like Sky News and BBC News 24 look so good. Images look effortlessly crisp and well-defined, helped along by a lack of noise or smearing. Hats off to Hitachi for doing a stand-up job with colours - particularly skin tones, which look natural and contain very subtle shades that give them a 3-D feel. Among its other virtues is an acceptable amount of motion blur, and with hi-def material the pictures take on a new lease of life, offering even crisper detail, sharper edges, more vibrant colours. Overall, there can be very few complaints. Likewise with sound, which offers enough bass and crisp dialogue to make listening to movies an enjoyable experience. So if you want to buy a 37in LCD TV that you can afford without having to live on soup for the rest of your life then give this superb set a chance - you won't regret it.